Buy Gillette Fusion 8 Cartridges. Best shave reengineered thinner blades effortless glide. 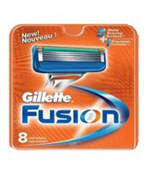 Gillette Fusion Cartridges are designed to give you a closeand comfortable shave with less irritation. The Indicator Lubricating strip releases more lubrication over a greater number of shaves, improving razor glide. The strip fades with use to signal when you are no longer getting the optimalshave. The 5 blade cartridge delivers a closer, more comfortable shave. The Precision Trimmer which is located at the rear of the blade is the perfect tool to deal with tricky spots like under your chin and sideburns so that your skin is smooth and abundant with radiance. This pack comes with 8 cartridges and you can use either foam or paste for the best results.